Representing Doble Engineering since 1982. ETMI can install and maintain Doble's IDD, Intelligent Diagnostic Device for Bushings and CTs. Since ETMI uses all Doble test instruments, we can provide comprehensive field training. 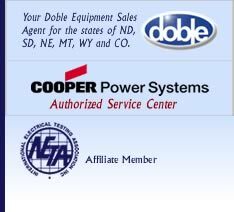 Doble Engineering Company is the world leader in apparatus maintenance and power management for energy delivery. Their decades of unsurpassed cumulative knowledge and field-testing experience have enabled them to develop diagnostic test instruments, which accurately assess electrical apparatus condition. Engineered to perform consistently despite rough handling in transport and under adverse conditions Doble instruments are legendary. For more information, visit Doble Engineering. Contact our office @ 605-787-4688 to arrange your on-site demo.